The Heidenhain TNC 640 has been conceived for machines that are capable of performing combined milling and turning operations. It offers powerful functions that enable you to switch between milling and turning mode in the NC program. You can create turning contours as usual in the HEIDENHAIN plain-language dialog for subsequent machining. Beyond this, you have typical contour elements for turning (recesses, undercuts, thread undercuts). With the aid of turning cycles, you can very easily program even complex turning operations at the machine. TNC programmers do not need to relearn, but simply add to what they already know. 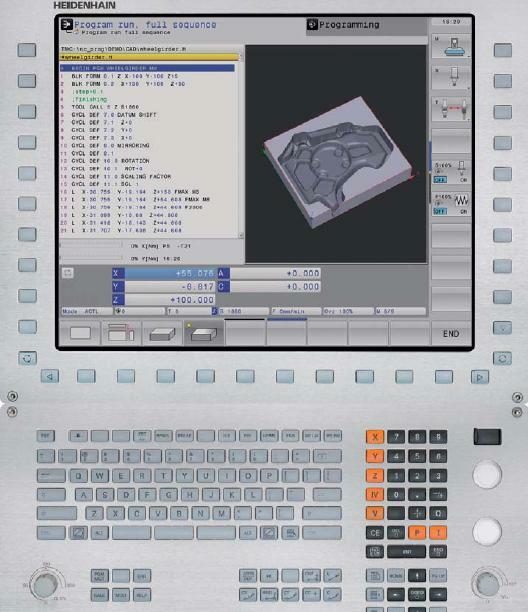 In addition, the TNC 640 has all characteristics typical of the TNC controls from HEIDENHAIN, such as shop-floor programming in plain-language dialog with comprehensive cycle packages or off-line programming. The TNC 640 controls up to 18 axes and 2 spindles. Thanks to its uniformly digital design with integrated digital drive control, you can realize high machining speeds and high contour fidelity. Also consider looking at the Heidenhain iTNC 530 here.